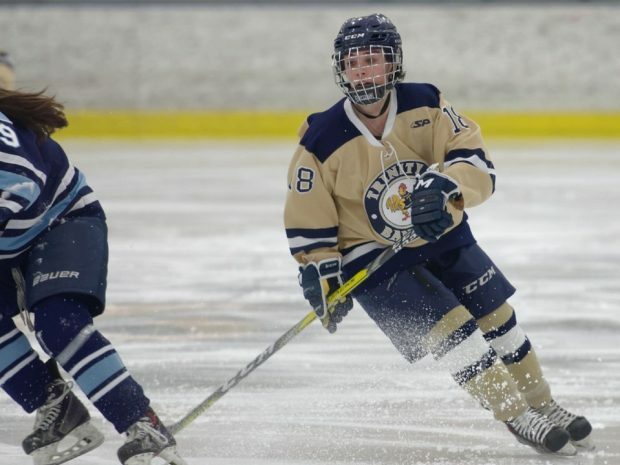 The Trinity Women’s Hockey team ended their regular last week as Bowdoin made their way to the Koeppel Center for a two-game series on Friday, February 17th. The Bantams finished the regular season strong with a win on senior day and a tie against the Bears to finish 9-12-3 overall and 8-6-2 in the NESCAC conference. The first game of the two-game series proved to be a defensive battle, as the teams finished the game locked in a 1-1 tie. The Bears jumped out to an early lead in the contest when Maureen Greason scored a goal on one of Bowdoin’s 12 power play opportunities. Trinity also netted their lone goal of the game in the first period when Olivia White ’20 fired a shot that bounced off the cross bar right onto Kelcie Finn’s ’18 stick, who deposited the puck into the goal to even the score at 1. Both goalies remained perfect for the rest of the game as Trinity’s Sydney Belinskas ’18 finished with 37 saves and the Bear’s Kerri St. Denis tallied 25. The game the following night was meaningful for Trinity’s seniors, who played their last regular season game at the Koeppel Center in their careers. The game was scoreless heading into the third period before Trinity freshman Maggie Cusik ’20 beat St. Denis to put the Bants up 1-0. With less than two minutes remaining, Taylor Foy ’20 fired a shot past St. Denis that sealed the Senior Day victory for Trinity. On Saturday, February 25th, the Bantams earned the right to take on Amherst in the NESCAC quarterfinals in Hartford. After a scoreless first period, the Purple & White were able to strike first when junior Alex Toupal caused a turnover in Trinity’s defensive zone, and then beat Belinskas for the goal. Trinity continued to apply pressure for the remainder of the contest but couldn’t quite find an equalizer. With under a minute left to play, Toupal netted her second goal to seal the victory and end the Bant’s season.